What did I do on my one day off, the start to my three day weekend, in between jobs? Seriously? You have to ask? I went on a trail run. Six miles up and down the Wapiti Trail at Heil Valley Ranch. Gorgeous outside too, with 50° and full-on sunshine. I wore shorts and a long-sleeve T. The weather will turn to snow around 6 or 7 and the temperature will drop to below 30° later tonight. Good thing I could run early. I would have enjoyed taking a week off between jobs but CenturyLink wanted me to start as soon as possible. They were going to have me fly to DC the first day but they couldn’t pull that off for a new hire. Would have been nice to meet all the team face-to-face but sort of glad because it likely would have required traveling on Sunday and I want my three day weekend. Just sort of hanging out now, setting up my new Mac Mini, merging photo libraries from various other machines. Fun stuff. Running in the midst of the changing season is like heaven to me. Fall is absolutely the best time. The cool air and dropping leaves portend winter is coming. I’ve been working crazy hours lately and not getting out enough, but after a 15 hour, soul-crushing Tuesday, I took off at 3 in the afternoon Wednesday for a dream run in wet, 50° temps. It was still a 9 hour work day, so I didn’t feel bad about the mid afternoon run. This photo is from last week’s Ridgeline Trail Half Marathon, about a half mile before the finish. That morning started off a cool 50°. I drove Ellie to Wiggins this morning for her last cross country race of the season. She wasn’t running due to a sore leg, but she wanted to cheer on her team. Wiggins is a farm town out east. For some reason, they ran on the roads. Which of course meant super fast times. The girl who won the varsity race ran the 5K in 15 minutes flat. Unbelievable. She won by about four minutes. I didn’t run the 5K much faster than that in college. This girl is going to be world class. Even without Ellie racing, I enjoyed my morning watching the other races. This photo above is of the varsity girls team. 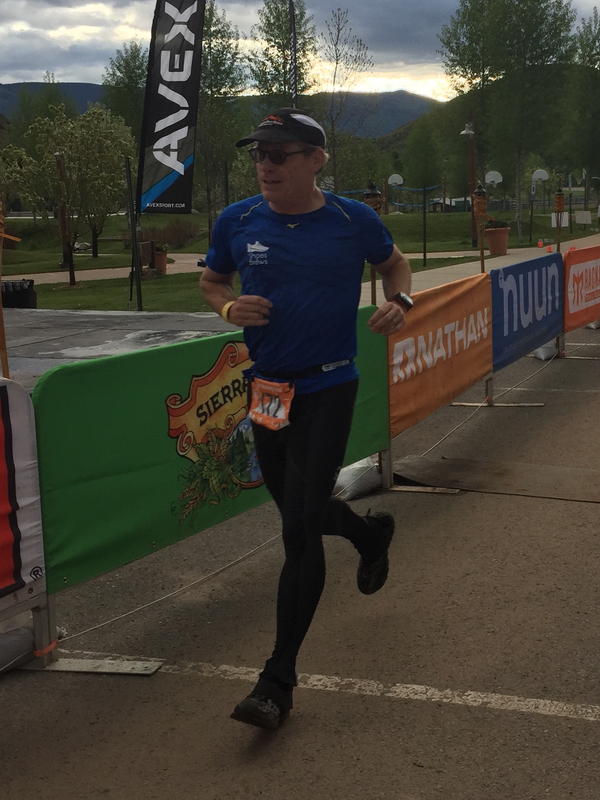 The Snowmass Ragnar Relay is an endless stream of runners, racing around trail loops through the hills above Snowmass Village. Starting Friday evening, I run four loops, green at 6:30 pm, yellow at 10:00 pm, green again at 5:30 am and the red loop for my finale at 12:46 pm. There are 200 other runners out somewhere along the 15 miles that make up these three loops. Math suggests there are over 10 runners per mile. Given the sparse distribution this late in the event, it’s rare that I find myself racing neck and neck against another runner. There are four runners running in the space of 100 yards in front of me as I start out the red loop. I pass three of them within the first mile, running on the bike path alongside Brush Creek Road, and just catch the fourth runner before turning onto Sinclair Road. I fail to pass him though. We run side by side for the entire second mile, still on the street. We introduce ourselves, both happy for someone to push us up this steep street. Dave looks about my age, which I mostly judge based on his conservative dress. Us older guys show less skin than the couple of kids we passed in the first mile. Dave is relentless on this climb. I would not run this fast pace the first two miles of this seven mile loop, were I running by myself. My plan was to go up slow and try to race down fast. Half the runners we pass are walking, which is fairly typical of all runners on their third loops. We’re both breathing loudly, but I make the bigger grunts by far. I sense Dave is better at altitude than me. The street ends just after two miles and we turn right onto the Rim Trail North. Dave sprints ahead of me to take the lead on the single track. I described the course elevation profile to him, having run this last year, while running up Sinclair. It helps to know the top of the climb is marked by a park bench at 3.5 miles. Dave is willing to let me pass him at one point during our ascent, because I’m breathing down his neck. I tell him that not only can I not pass him, but that I’ve been power walking for the last quarter mile. When you can walk as fast as someone else can run, you should walk. It’s an interesting phenomenon actually on steep mountain trails. It lowers the heart rate but maintains the same speed. No doubt, this just pissed Dave off. Dave screams downhill as soon as we begin our descent. I try to follow his pace but he forms a sizable gap. Another much younger runner that Dave has passed runs between us for about a mile. Once I pass that kid, I close the gap with Dave. This is past where the red loop joins the yellow, after 5 miles. I finally pass Dave crossing the first wooden foot bridge. I suspect the 3.5 mile descent was too long for his wicked pace and shredded his legs. Running downhill provides you with unlimited oxygen, but your legs turn to jello. It gets a little scary when you lose confidence in your ability to brake around curves. My slower start to our descent left me with some strength at the end. These 24 hour relays are all about self preservation. It takes discipline to maintain the strength to finish three or more runs on seriously steep mountain trails. I would have loved being able to race each loop with equal intensity, but I couldn’t recover well enough from my first run, and I wouldn’t have had anything left to run so hard on my final loop. Really happy I chose to run the middle loops slow and easy. My thighs are still sore the next day, which tells me that running the downhills took more out of my legs than the uphills. Running uphill makes an impression on your heart and lungs, but it’s the downhills that thrash your muscles. 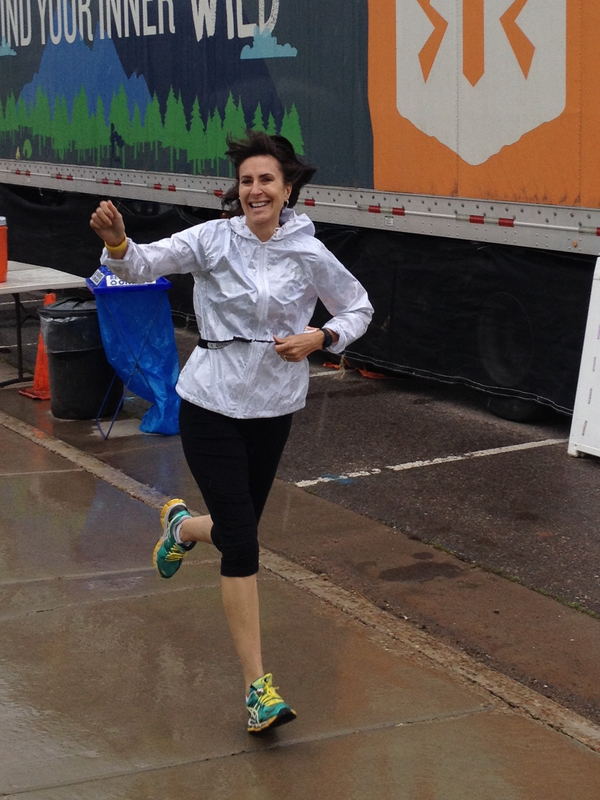 This photo is from last week’s Bolder Boulder, just before the 6th mile, turning off Folsom. I like how it shows another mature runner directly behind me. Several of my teammates commented on how this year’s Snowmass Relay seems younger and more competitive than last year. I think us old runners hung in there though. Running Steve Prefontaine’s Trail was first on my list of runs while in Eugene. I got sidetracked by a little 4 mile turkey trot yesterday. Chad and I were able to run 6 miles down here this morning. The trail sits along the north side of the Willamette River, across from the University of Oregon campus. If you don’t want to sound like a tourist, you say Willamette like, “will dammit”. Pre’s Trail reminds me quite a bit of Town Lake in Austin. Much more narrow and tree covered. They run high school cross country races on it. The middle leads right up to Autzen Stadium. In fact, we’re returning in just a few minutes to attend the Oregon – Oregon State football game. The fun never ends. The last time I ran up Green Mountain, above the Flatirons, my foot clipped a tree root on the decline and I somersaulted into a ravine. Fortunately the poison oak broke my fall. Unfortunately I was shirtless, this was 26 years ago, and I had to scrounge around the plants for my car keys. As I climbed back up to the trail, I thought to myself, “How am I still alive?” After 26 years, I’m in good enough condition to run it again. There are probably more Green Mountains in Colorado than there are Beaver Creeks. 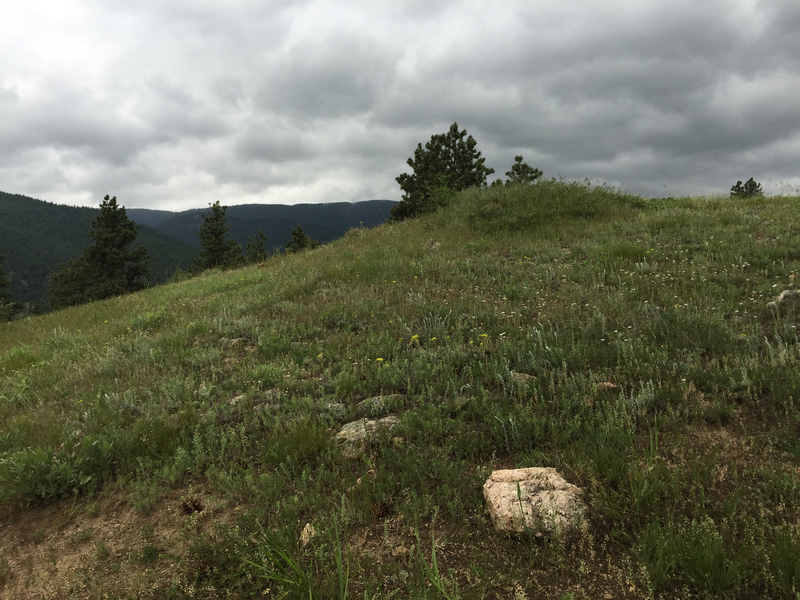 There’s a popular Green Mountain in Lakewood with ample paths, but this has to be the most famous Green Mountain for trail runners. I started out late afternoon from the Chautauqua parking lot and ran over Ski Jump Trail to reach the Gregory Canyon trailhead. From here it’s about a 3 mile, 2300 foot climb. I took Gregory Canyon Trail to Ranger Trail, which averages a 17% grade. I’d call the lower third 30%. The top half was mostly snow and ice. 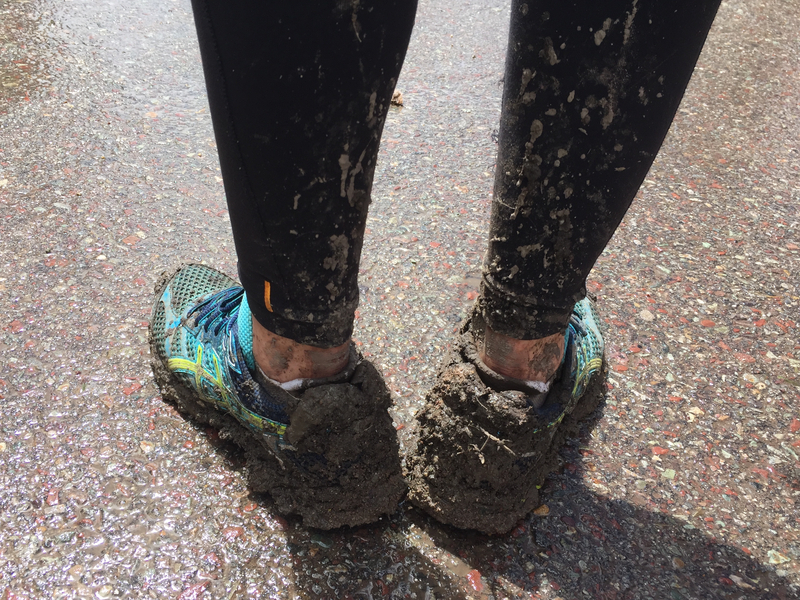 I was unprepared with my 1000 mile trail shoes and no nano spikes. I met a couple in their young twenties at the top. They were hanging out next to this peak finder, viewing the Indian Peaks and getting stoned. Weed is certainly more convenient than carrying up a six pack. They told me they came up E.M. Greenman Trail. I figured if they could navigate it stoned in tennis shoes, it might be less dicey than the death trap I just ascended and made a loop out of it. It was worse. I had to commit to a forward lean, about like skiing. If my ascent was a shuffle, my descent was a controlled slide. Only fell once but honestly I think I was running slower down than on the ascent. Conditions improved half way down and I was able to run a fast final mile over the cushy, pine needle carpet. I reached my car just as the sun sank over the Flatirons. I’m going to start running this trail more now that I’m in shape for it. But with my nano spikes. Guess where I’m spending Thanksgiving? Eugene, Oregon, where I intend to run as many of their world-renowned, urban running trails as possible. Especially Pre’s Trail. This is a tremendous bucket-list thing for a trail runner. Oh, and I expect to visit family over the holidays who moved to Eugene a year ago. Second on my list will be to run the Ridgeline Trail, ideally from the Spencer Butte Trailhead. There’s a 1000 foot climb that I can run either over a .6 mile route or a 1.1 mile path. This trail runs around half the city. Then there’s beer. Eugene is famous for its brewpubs. Comment with suggestions. Otherwise I’m looking at the Falling Sky Pourhouse and Ninkasi Brewing Company. In case this isn’t enough, Animal House was filmed in Eugene. I understand the Delta House has since been demolished, but I bet there’s a $5 tour to be had. You might not be a fan, but this movie captures my memories of college. I even own the Animal House edition of Trivial Pursuit, gifted to me by a buddy. Karen’s sister will have her house decorated festive for Thanksgiving, a comfortable respite from the daily grind for watching multiple days of college football. Brit and Ellie want to drive to see the coast. My focus though will be on the soft bark trails of Eugene. Can’t wait. 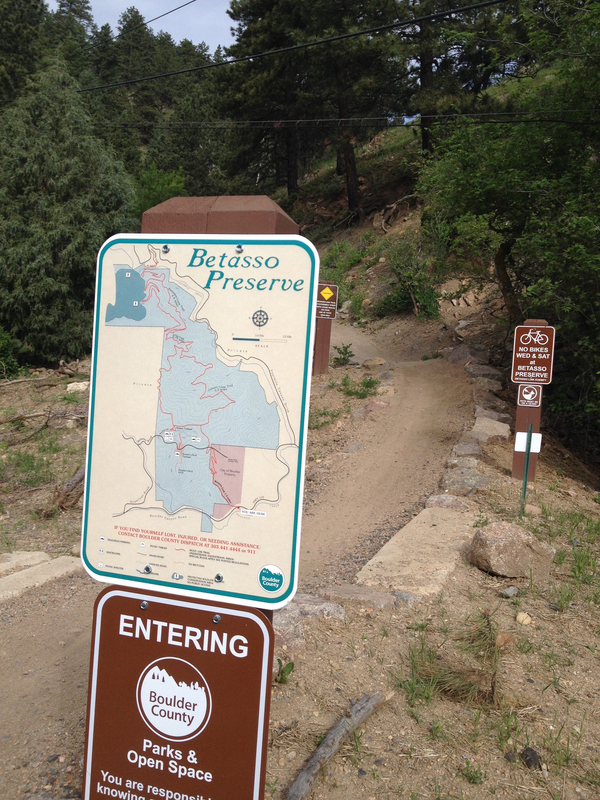 Gadget Girl told me about the Betasso Link Trail off Canyon Drive a few weeks back. Today was my first chance to get up here. The trailhead sits just before and to the right of the tunnel, three miles from the edge of town on the drive toward Nederland. You can drive another mile further to Sugarloaf Road to reach a trailhead at the top if you want to skip this rugged 1.3 mile climb. I wanted the climb. It rises over 600 feet, the steepest part in the first quarter mile. That’s just about the limit of grade I can handle without walking. When Gadget Girl’s husband rides with her, they start at the top but Dave rides this link trail down. She picks him up on the drive home. The trail is hard and slick, with intermittent boulders. A biker started out before me and I figured I would pass him. I find that I typically pass mountain bikers uphill but this guy was unreal. I did finally catch him once after he dismounted for a particularly steep rise but he passed me back quickly. Really, I was just right behind him the entire climb. And we passed several others. While slower, they were still extremely skilled. This black diamond trail is technical for bikers in both directions. For runners, it’s gorgeous. 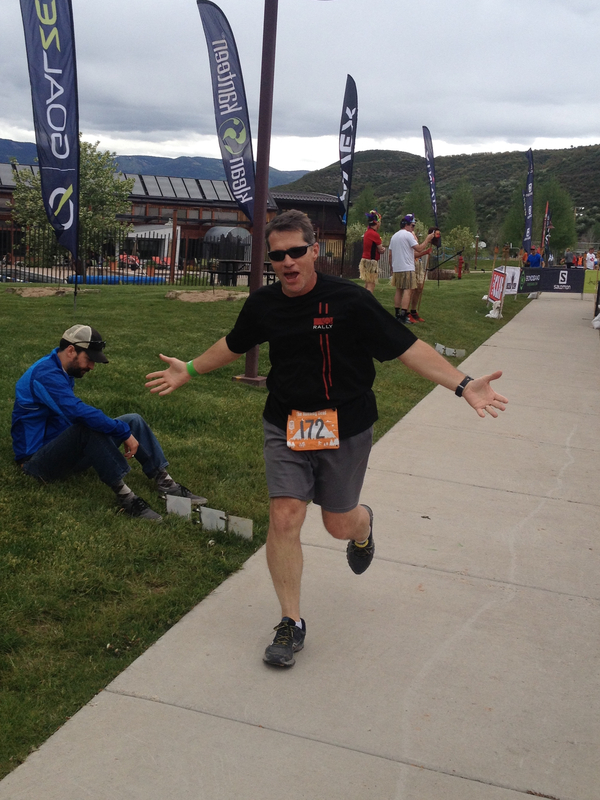 I thought of Keith’s face after he completed the first loop last weekend in the Snowmass trail race. For anyone who finds running burdensome, try running a mountain trail. 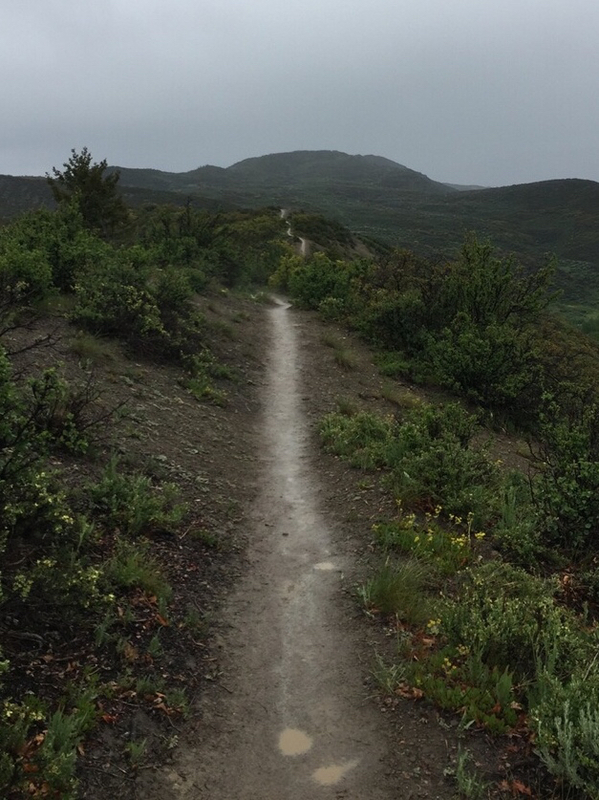 Trails like this turn workouts into a rapturous experience. The top of the climb empties into an open meadow and links to the Canyon Loop Trail – a 3.3 mile loop. A sign instructs bikers to ride counterclockwise. I read this direction alternates monthly. There are no similar guidelines for runners but commonsense implies that running clockwise is optimal so you can see bikers coming. There are also signs (you can see one if you click on the trailhead picture to enlarge it) that state no bikers on Wednesdays and Saturdays. Good to know, although I didn’t find this morning overly crowded. The bikers were all courteous and skilled well enough that we could both usually pass by without surrendering momentum. In fact, the first mile of the Canyon Loop was double track, and much of the remaining loop was still wide enough for passing. On occasion, I even yield for bikers, when it seems fair. Hate to see a biker topple over on these sharp hills. Running was softer up top on the loop than on the link trail. Dry and not nearly as supple as the soil in Snowmass. Those trails were dreamy. My trail flats gripped those paths near the Maroon Bells like leather gloves on the steering wheel of a muscle car, accelerating through turns. The Canyon Loop contains several similar sections where the trees were thick enough that moisture clung to the dirt to turn its color black. And there were a half dozen streams which were fun to hop across. The loop was never flat, rather rolling and twisty. I took the first mile to recover from the climb but then found my legs and enjoyed some speedier running where the trail allowed. After a single loop, I returned back down the link trail to my car. I found the descent more technical than the climb. My year old trail shoes slid a few times. Manufacturers tell you to buy new shoes every 500 miles. I tend to log over 2000 before shodding a new pair. Traction is certainly a critical criteria in trail shoes so perhaps it’s time. To survive this descent, I focused on form. The trick to avoiding slippage is to never let your feet touch the ground. Since I can’t actually fly, I begin raising my feet before they fully touch down. Very, very, quick, short steps. Allowing your heel to fully flatten is courting disaster. Running downhill like this is seriously exhausting and difficult to maintain for much more than a mile. The other technique is to walk, but even then it’s wise to avoid putting too much weight into your landing. I made it down safely. And really, I didn’t rush down overly fast. I played it safe. I can’t believe this was my first time up on this hill. Next time I intend to run two or three loops up top. I’ll be back to Betasso. Sometimes, when I don’t like the forecast from my Weather Channel mobile app, I check their site on my laptop. They rarely agree. Still, there’s little difference between an 80% chance of rain, and 70%. In a semi-desert state like Colorado, anything over 20% means rain. Lots of it. 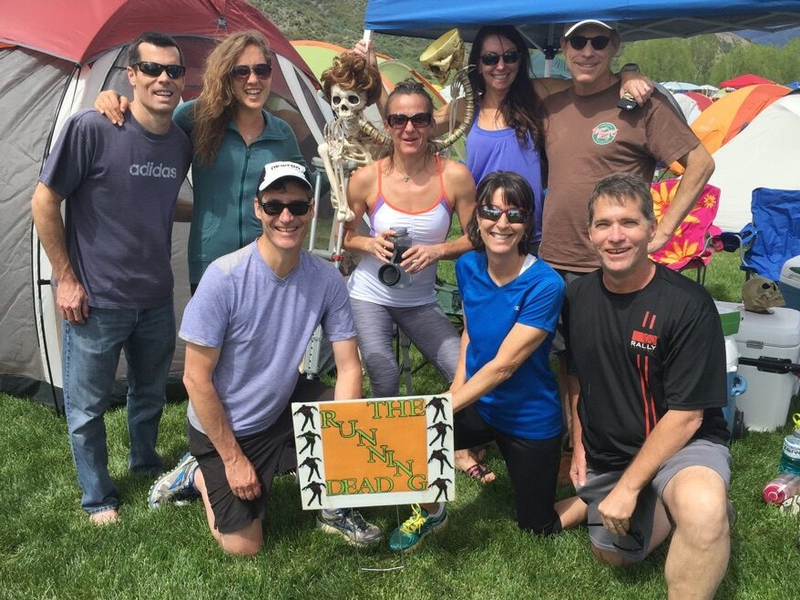 So my Running Dead trail relay team drove up to Snowmass for our trail relay on Friday with soggy expectations. We were surprised at how so much rain could go unnoticed. We had a total blast. From left to right in the back row is Chris, Allison, the Dead Runner, Jill, Jen, and me. Up front is Keith, Rychie and Steve. We arrived with just enough time to pitch our tents and watch the team safety video before Steve kicked off our relay by running the 3.9 mile green loop. Our race instructions listed the green loop as 3.3 miles, but a conversation with the Here Kitty Kitty team captain Brian suggested it is more like 3.8 miles. My Garmin recorded 3.9 miles. Running the extra distance wasn’t an issue for any of us. We came here to run. But no one likes surprises when their legs are drowning in lactic acid. The pre-race intel was critical at setting our expectations. This was Steve’s first race after heel surgery. Some suspect his first real run. He performed like a champ. Steve handed off to Rychie who ran the 4.1 mile yellow loop in our first rain shower. She reported the wet trail conditions as apparently difficult for bigger, heavier guys as they struggled to negotiate the muddy slopes, but that she was able to nimbly maintain sure footing. Rychie’s training with Jill on the rocky Picture Rock Trail in Lyons proved itself invaluable for these conditions. Jill followed Rychie on the 6.9 mile red loop, which was advertised as 6.2 miles. 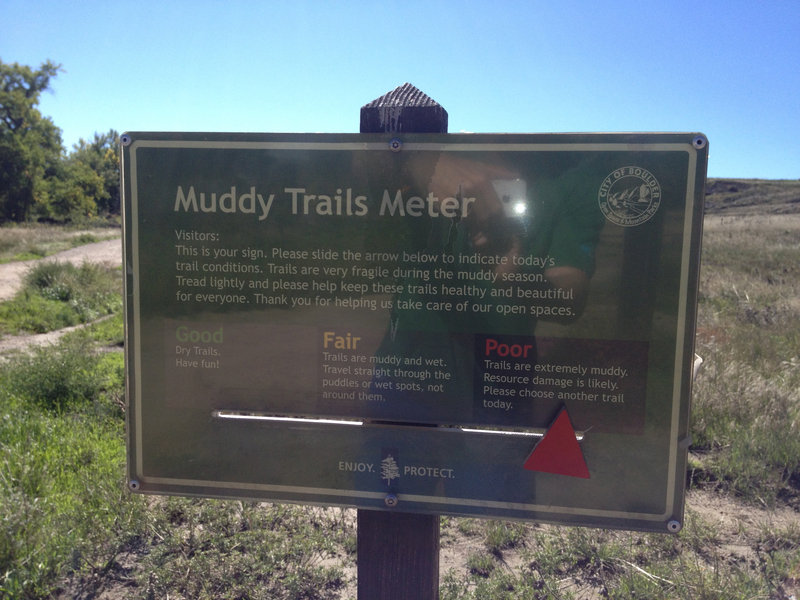 This began on paved trail and road for two miles, mitigating the danger of slipping in mud. Jill and Rychie’s strong runs kept us on our pre-race schedule, despite being over one mile longer than plan. Rychie and Jill are new friends for me. I discovered on the ride up that like me, they both are mid-westerners. Rychie is a farm girl from Fremont, Nebraska and Jill is a farm girl from outside Chicago. I’m from Davenport, Iowa, which one could argue is a distant Chicago suburb. I was a Bears fan back in the day. Rychie manages the professional development of school teachers now while Jill owns a landscape enterprise in Longmont. Both sounded disappointed, and just plain pissed with themselves that they had to walk a few steep slopes of the trail on their first runs. I explained to them that it’s not really walking on mountain trails; when you’re primarily running, it’s a shuffle. They didn’t really accept my shuffle concept. These girls might look like innocent working professionals, wives and moms, but they’re the reason Lance Armstrong doesn’t own a second home in Boulder County to train. 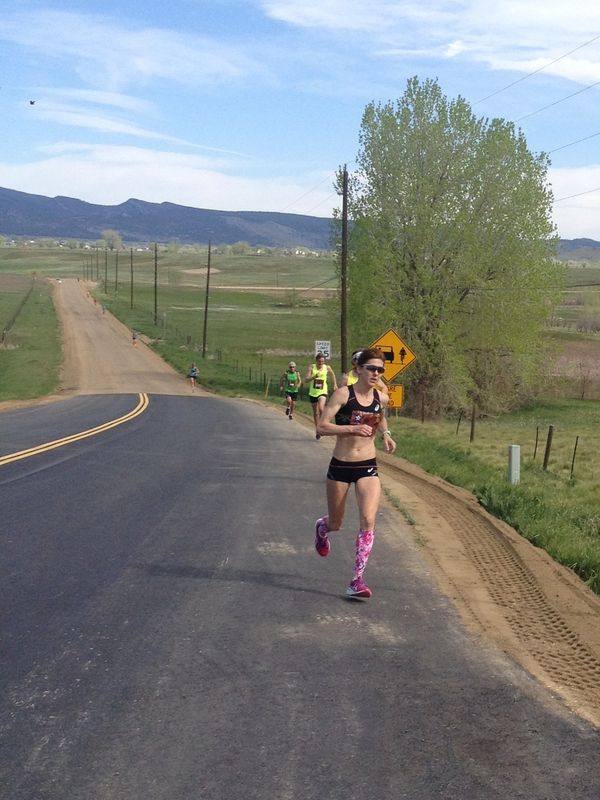 The women on Mesa Trail aren’t intimidated by the Aspen elites. Keith was our 4th runner and started out on the green loop to repeat our 14 mile cycle of green-yellow-red. He returned elated over the beauty of these trails. And no doubt happy that he ran quite well, passing many other runners. Jen, always strong, ran 5th on the yellow trail, followed by Chris for a repeat of the red trail. This completed two rounds of the three loop sequence and brought night fall over Snowmass. I waited by the bonfire for Chris to finish as the temperature dropped with the sun. Chris didn’t report any issues navigating the trails via his headlamp. I was apprehensive as trail running at night was a first for me. While I believed I could pass runners immediately, I held back to gain comfort with reading the trail. My caution paid dividends as the grade of the green loop rose dramatically the first half mile and the runners in front of me fell back from oxygen debt. I had to walk a few steep steps the first mile and again the second mile, but mostly maintained a steady cadence up to the top of the mountain, just under two miles into the loop. I held my pace under 10 minutes the first mile, and under 12 minutes for mile two. Returning downhill in darkness was surreal. Running under an 8.5 minute pace via headlamp felt like playing a first person shooter video game as I weaved my path around the curvy, tree-lined course. I passed more runners on the downhill than up, no doubt they were being cautious. The only reason I couldn’t soar down this trail faster wasn’t the turns. I could see those fine with my 550 lumens Olympia EX550 headlamp. Rather, my difficulty was in reading the shadowy dips in the undulating trail. I alternated from hyper extending my stride on deeper troughs than I expected and jarring my hips on the steps that came up short. I slammed into a wooden foot bridge hard when I didn’t see that the initial on ramp was twice as steep as the middle of the bridge. I nearly buckled. I took the foot bridges slower after that. Our team ran through the night rain free. Rychie shared my initial nervousness but everyone agreed afterward that nighttime running was a total trip. Anything leading you to run slower was a good thing in terms of pacing you for the total half marathon over three loops. A good two hundred runners on the trails kept you in close company at all times. I woke up at 3am for my second run amazed to see streams of light from runners’ headlamps snaking along the sides of three mountainsides. Very cool. My second run was on the 6.9 mile red loop and coincided with sunrise near the top of the course. This trail photo above is of the path leading to the top at around 3.5 miles. I was able to turn off my headlamp for the downhill, which was a total scream. I didn’t kick too hard though because I was expecting to have to run another loop. The plan was to either run with Allison on the next leg, or for Steve on the leg after. Both had injuries. Allison blazed her leg on her own but 50 minutes later I ran Steve’s yellow loop for him. This was much tougher than I expected. My heart rate was still elevated from the red loop and my legs took a good half mile to loosen up. Fortunately the yellow loop begins with a graceful slope and I was able to unwind. Once I got going, I felt great and ran my fastest pace of my three runs, an 8:49 pace. Steve nominated me for team MVP for my unselfish act. I lost to Jen who later ran the 6.9 mile red loop on her third run in a torrential downpour. Understand that nearly every runner mostly walked their third loops. 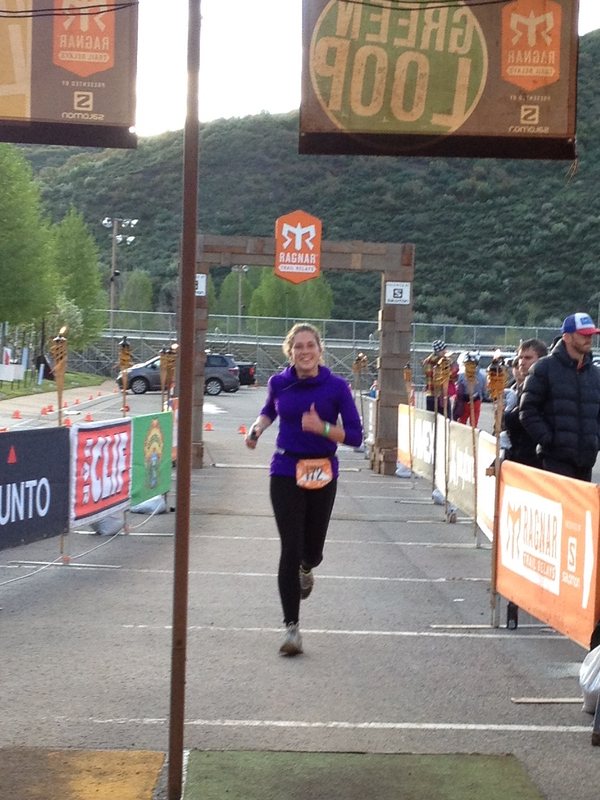 As Jen reached the summit of the red loop, all the runners were turning around, too afraid to descend the river of mud. 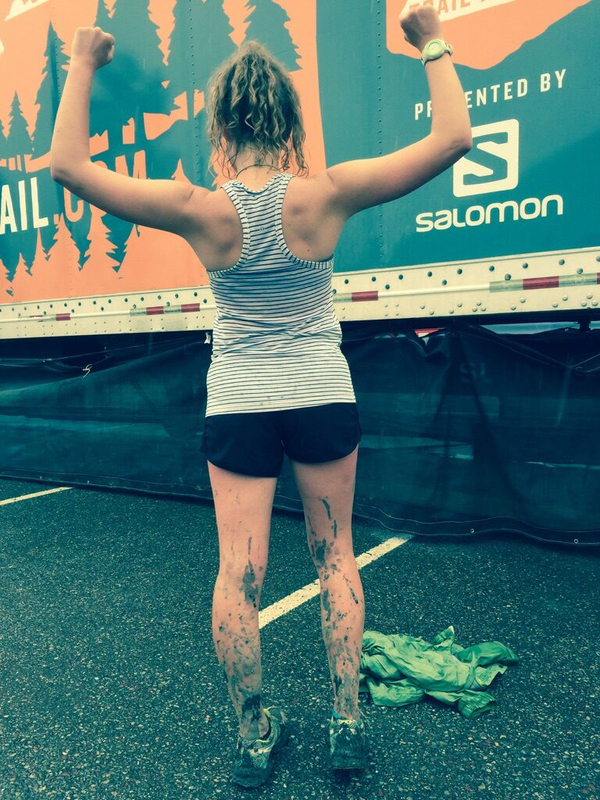 Undaunted, and frankly disgusted by all the sissy runners retreating, Jen screamed down that mudslide full throttle. Here’s a photo of her shoes afterwards. Had Allison not been out barhopping with some runner boys during the MVP selection committee’s discussions, she might have won MVP for her final performance. My final run was spectacular – my fastest yet. An 8:20 pace. But I ran it on the very unspectacular yellow loop. Like Jen before her, Allison ran the red loop. The trail of heroes. We were chasing Here Kitty Kitty for the last 20 hours. Our Longmont competition, four hours from home on a mountainside in Snowmass. On the longest loop, with the greatest elevation gain, Allison outran their team captain to bring the glory of victory to our team. But as I said, she was out drinking during the awards ceremony so Jen won MVP. Naturally, the sun came out once the relay was over. We spent the night in a couple of Snowmass Village condos where we washed off twenty-two hours of mud, sweat and grime. I never once expected this relay to be so grueling. So totally exhausting. And what’s wrong with my friends and neighbors to make them not only want to do this sort of thing, but to so thoroughly enjoy it? Is this what it means to live in Colorado? I think it does. The mountains exist for running. I came with zero plans for speed or achievement of any kind. 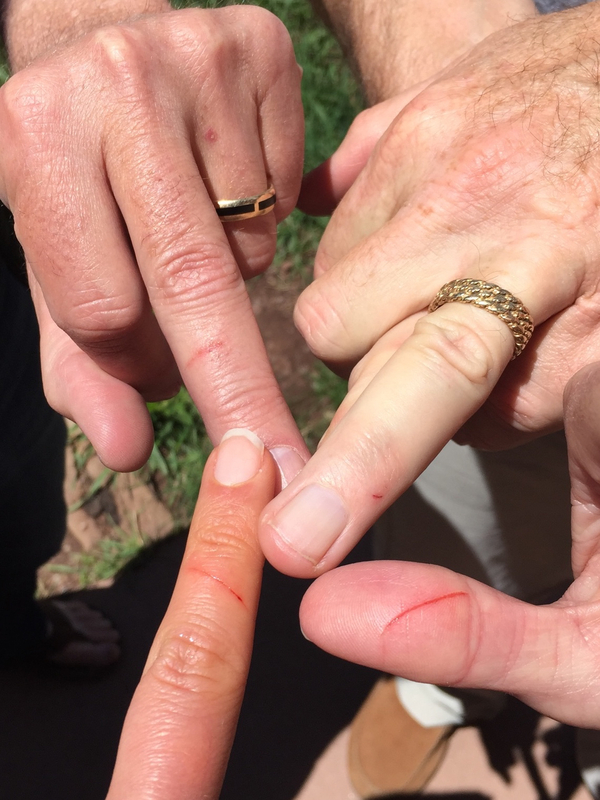 Just the social aspect of running on mountain trails with good friends. And yet, every loop was an amazing race. I ran strong every mile and was never passed. 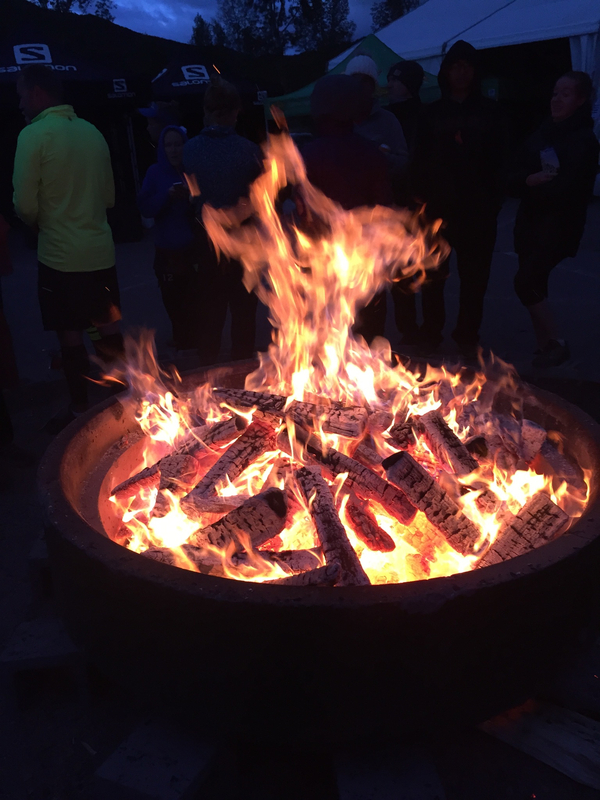 This was the most extraordinary running boot camp I’ve ever participated in. We were presented with participant medals that carried the seal of non TSA approval. Seriously, they came with a warning to not try sneaking them past airport security. Not sure how to describe them really. Some sort of survival utility toolkit. 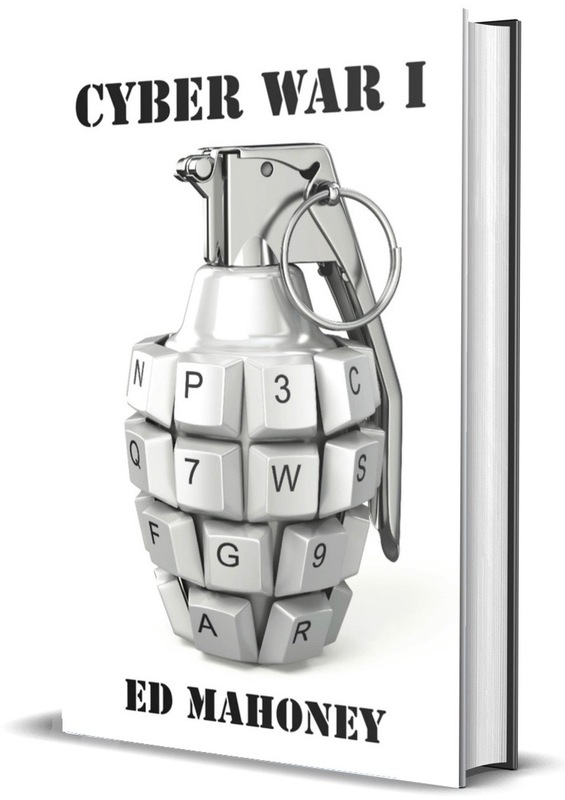 Think of a one pound razor blade that could take out your enemies with a flick of the wrist. Half our team cut themselves within an hour of the relay’s completion. The sun rose the morning after in a cloudless sky. 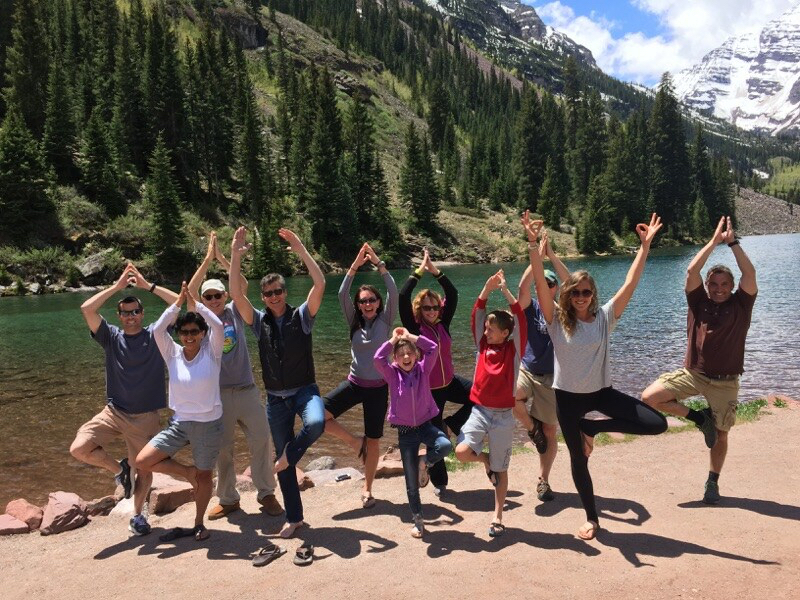 We brunched at Aspen Over Easy and stopped by the Maroon Bells before heading home. We took the slow drive over Independence Pass. Hard to imagine things getting better after the most thrilling trail run ever, but I swear to you, it just kept getting better. This week included a couple of runs in the never-ending rain. Normally I enjoy the runs where I can literally kiss the low-hanging Colorado clouds. Ever see the 1983 video of U2 perform at Red Rocks? It’s like running in some mystical place with unicorns. This has been all too common place lately. Today though was clear blue sky and I kissed the clouds goodbye. 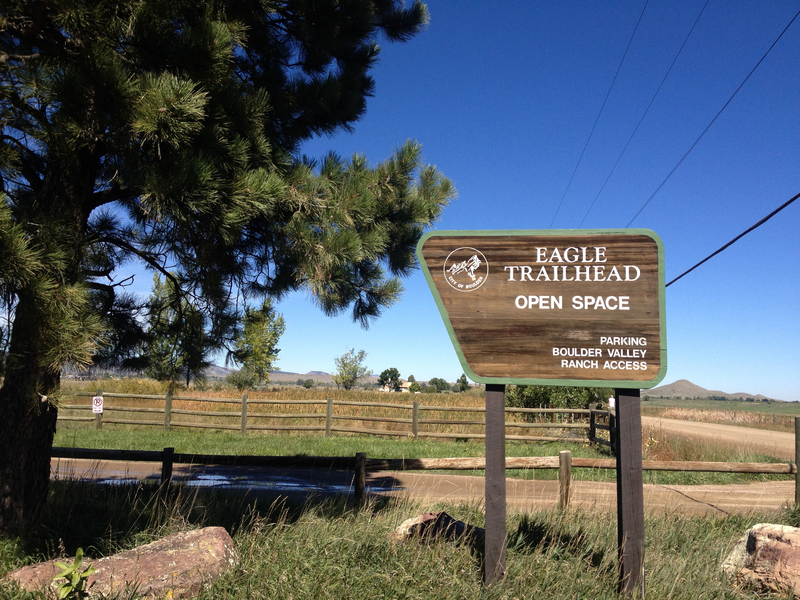 Taking a cue from Jabe’s recent facebook update that the Eagle Trail is open, I headed out to the Boulder Valley Ranch set of trails. I can’t believe I have never run here before. It’s not exactly exciting. Very few trees. But Gadget Girl often runs here with her dog Otis; so does Jabe’s running team. Given conditions, I’m happy to run out here in the prairie grass. I need to keep up my trail running. I signed up this week to run the Durango Double Ultra, a 50K (30 mile) trail run through the San Juans. My first ever ultra. This wasn’t on my radar but with my two marquee September runs cancelled, I need to up my game for October. I’ll follow this ultra the next weekend with the Denver Marathon. New plans. Hard to explain but maybe this has happened to you before. You train hard for a marathon. Sometimes when an event is cancelled, you feel like you escaped a bullet because you weren’t quite prepared. I was ready though. This might have been overly optimistic but I thought I had a chance at an 8 minute pace which would qualify me for Boston. When you reach that level of fitness, you sort of want a replacement marathon. Only thing is now I have to maintain this fitness level another month. I can do that. If I survive the ultra, I’ll be primed for the marathon. 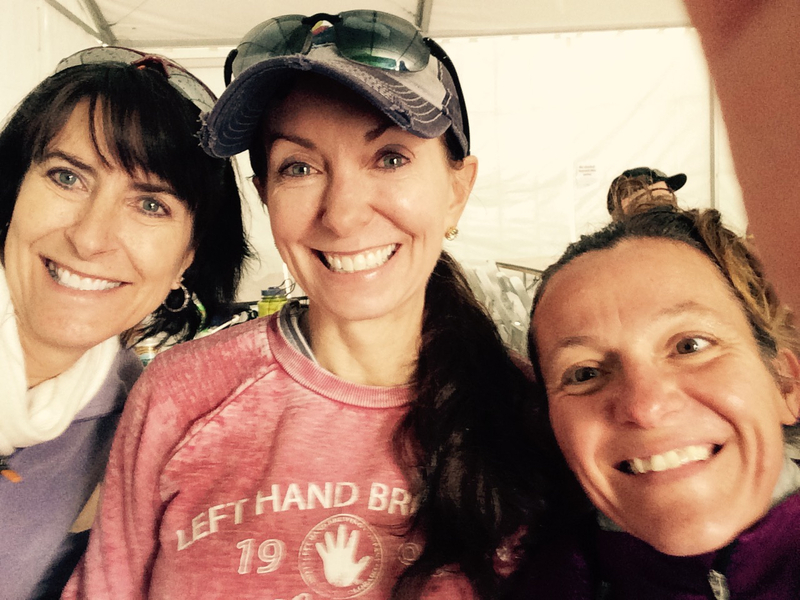 My Team Naked partners plan to run Eagle Trail tomorrow. I have to bail on them to drive my in-laws to DIA. It’s a large trail system. I parked at the Eagle Trailhead near the Boulder Res. The first trail here is a 3.7 mile lollipop. Eagle Trail begins as a half mile stick, then forks left while Sage forks right. The two forks join up again 1.35 miles later to form the loop. I forked right onto Sage and then right again onto Cobalt. This led me to North Broadway Road where I returned on yet another fork right called Deggee Trail. Not sure how you pronounce that. I could have returned more directly but I wanted to get in a long run so took a number of exploratory trail spurs. I forked right on Hidden Valley Trail which I could have taken earlier for another loop option. I also humped up onto Mesa Reservoir on the return. 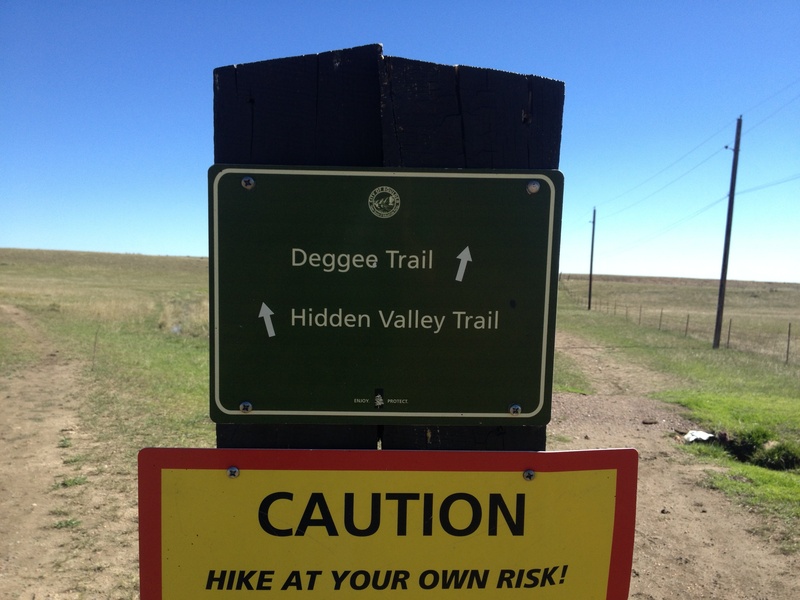 I think on future runs I’ll make a large loop out of Hidden Valley Trail and the Sage/Eagle combo. That’s probably good for a 6 mile loop. Twice makes 12 miles. Much of this trail is fairly pedestrian. In fact, the first loop is double track. Still, gaiters are a good call to keep the little pebbles out of your shoes. 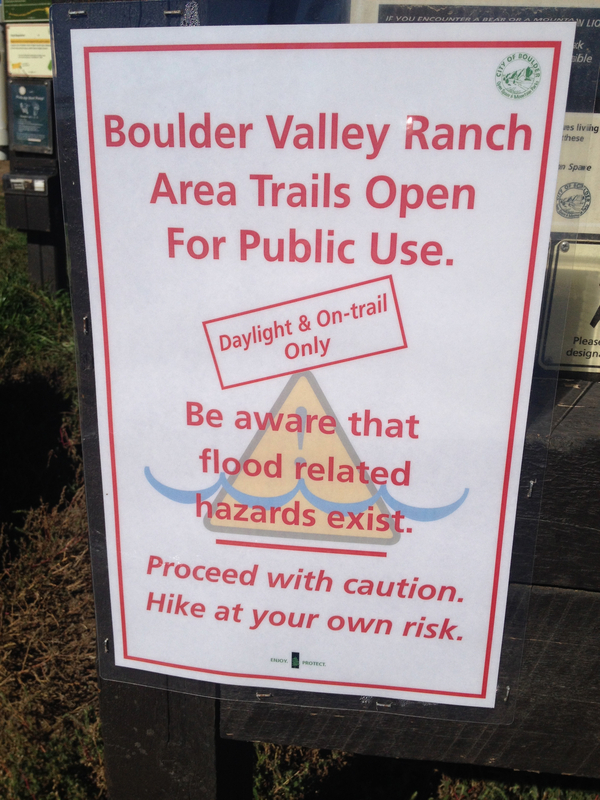 I think the muddy trail warning sign could be dialed back a bit from poor to fair. The mud’s not extreme, although sticky in spots. The trail is nice and soft, feels good on the knees. Look at that blue sky in this last photo. About time. Plus the temperature was a fresh 54°. Perfect seasonal running conditions have returned to Boulder County.